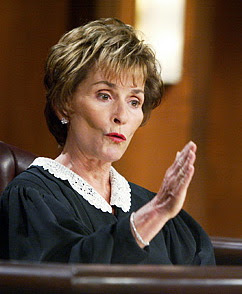 Judge Judy would not be amused. She and I get upset when stupid people screw things up. I went to court today to face down a drug dealer who stashed drugs on my unit and was allegedly selling them to the other patients on the unit. I didn’t see Scum Bag selling the drugs, but I found his stash when I was searching his room for cigarettes. So, there I was, waiting for the bailiff to call Scum Bag’s case when the judge finds out that Scum Bag didn’t make it to court. Apparently Scum Bag is in another county jail, and someone forgot to fill out the paperwork requesting Scum Bag’s presence in court. Hence, I wasted my day and the judge was really pissed off. The State’s Attorney told me to look for another subpoena in the mail. Oh joy! I hope Scum Bag gets life in the poky for screwing up my day. Ugggg I feel bad for you. Not likely that he'll get life for messing up your day... but it's nice to dream, I suppose. I'm sorry that things got bollixed up like that -- but I'm sure you'll be ready to go next time out (when there'll be another postponement but probably for a different reason) and even the next time out after that (who knows, third time may be the charm?). What a freaking waste of time! Sorry you had to miss work for such a piece of crap!